Nritya for Body and Soul, the latest Research work presented by Nritya Prerana International School of Dance. Exercises based on the Classical dance form “Bharatnatyam “originating from the Natyashastra and Abhinayadarpana, it uses a variety of postures and movements which form a part of this ancient classical dance form. Bharatanatyam is made up of a number of movements, called adavus, each using a different part of the body. Some of these movements are static, while some are fluid – but the purpose of both extends beyond mere exercise. This dance form is based on the yogic element and creates harmonious relation, between the mind, body and its end goal. TheResearch and documentation centre of Nrityaprerana school of dance pune, through over 3 decades has worked under guidance of Mrs. Suchitra Date for using nritya as therapy.A trained Bharatnatyam danseuse and a trained social worker from Tata Institute of Social sciences Mumbai,she has uses Nritya for therapy for special children,physically and mentally challenged, polio affected, equinus deformity(i.e walking on toes),parkinsons affected, Alziemers affected, ‘over stressed groups’ in corporate world, depressed women in 40’s etc.It was during this work the usefulness of the developed therapeutic effects of exercises was noticed amongst those who came to learn this dance form. Its positive effects on memory, synchronization of eye hand feet co-ordination, balancing, emotional venting, dealing with frustrations all had a fantastic ability developing characteristics. Thus the seed for Nritya for Body and soul was sown. Nritya for Body and Soul, is thus not another exercise program to jump on the ‘weight-loss quickly’ bandwagon, but intends to unite the mind and body, and lets them function as one. The mind controls the body, and the body can likewise influence the mind – and this endeavour focuses on this very connection. 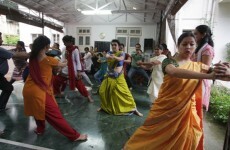 Nritya for Body and Soul is a holistic approach to health. Today’s stressful world leaves no breathing space to look after oneself. What surprised the Dalai Lama about humanity quotes” is Man…because he sacrifices his health in order to make money. Then he sacrifices money to recuperate his health. Then, he is so anxious about the future that he does not enjoy the present, as a result, he lives as if he is never going to die, and then dies having never lived.-(Dalai Lama xiv). Nritya for Body and Soul creates an awareness to love thyself and to be happy through its wonderful recommended exercises through dance, a natural god given gift. This is the 1st ever effort in India, a landmark, to help our fellow country men and women learn through dance (nritya), exercises meant for all ages. Nritya Prerana presents Nritya for Body and Soul Part 2 called Nritya for Good Health. No charges for attending these sessions. It is open for people of all ages. Feel Happy and spread the word, Dance is Healthy.